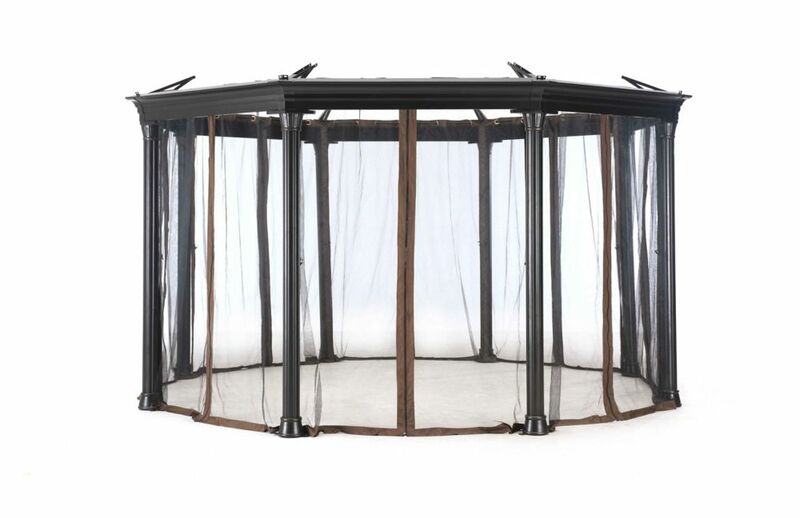 Sunjoy D-GZ845PST-MN Low-Maintenance Universal Mosquito Netting for Octagonal Gazebo builds a fortress that keeps bugs out.Full zippers meet in the center of each side of the gazebo, allowing you to create an entrance/exit on any side. Fits on Sunjoy Octagonal Gazebo model numbers: D-GZ845PCO-H, D-GZ845PCO-I,D-GZ845PCO-K, D-GZ845PCO-L, D-GZ845PCO-H1, D-GZ845PCO-I1,D-GZ845PCO-K1, D-GZ845PCO-L1 Keep bugs out of your Sunjoy Octagonal Gazebo! This universal, low-maintenance, quality mosquito netting is made with a tight netting weave, keeping even the smaller bugs out of the shaded sanctuary. Its easy to install, easy to clean, durable and low maintenance! More importantly, its great at keeping bugs out! Order yours today! Universal Netting For Octagonal Gazebo Sunjoy D-GZ845PST-MN Low-Maintenance Universal Mosquito Netting for Octagonal Gazebo builds a fortress that keeps bugs out.Full zippers meet in the center of each side of the gazebo, allowing you to create an entrance/exit on any side. Fits on Sunjoy Octagonal Gazebo model numbers: D-GZ845PCO-H, D-GZ845PCO-I,D-GZ845PCO-K, D-GZ845PCO-L, D-GZ845PCO-H1, D-GZ845PCO-I1,D-GZ845PCO-K1, D-GZ845PCO-L1 Keep bugs out of your Sunjoy Octagonal Gazebo! This universal, low-maintenance, quality mosquito netting is made with a tight netting weave, keeping even the smaller bugs out of the shaded sanctuary. Its easy to install, easy to clean, durable and low maintenance! More importantly, its great at keeping bugs out! Order yours today!